The battleship was heavily damaged. The engine has been damaged due to the long high speed chase through the pacific. It was chased by a whole fleet, the British fleet. The battleship is the Dresden, a German ship that had been in battle with the British fleet for some time and now it was trying to escape it’s doom. The Germans were lucky, a local guide knew of an unmapped bay where it could hide. And so they navigated through the narrow fjords of Chile and carefully maneuvered the 180m ship through this small gap into an opening fjord. It was able to hide here for more than 3 months and getting most damaged repaired. It went back into to the pacific and was sunk eventually by the own crew since the British were preparing to take it under fire even though it was in a neutral Chilean harbor with no coals, unable to escape or battle back. It is one of these famous stories of the first world war, when battles have been fought all over the planet and stories of death, suffocation, hope and destruction appeared on a daily bases. I have heard the story of the Dresden before. And now Claudio is telling it to me again. “There, through this small gap the Dresden was maneuvered through”. I look at a gap in the mountains, a mere 160m wide, with vertical walls on both sides. The small gap makes a sharp turn, so that it looks like a small opening in the mountains that would end soon. But the map on the table shows the fjord is opening on the other side of the small gap and is actually a huge bay. “A difficult and brilliant maneuver, but the only chance the Dresden had” Claudio adds. Claudio is the captain of the small ferry that connects with the northern end of the Carretera Austral in southern Chile. I talked to him when he was getting his coffee and so he invited us on the bridge of the ferry. He showed us all the equipment of the bridge, the different radar systems, radios, GPS, the classic sea maps, the steering, the log entries. It is very interesting and Claudio is a very nice person. Very calm, relaxed. He used to be in the salmon business. The whole southern part of Chile is very big in breeding salmon. Everywhere are huge farms with hundred thousands of salmon. He explained to us the procedure of how the salmon get breed in huge sweet water tanks, before they are transported alive in boats with water tanks to the salt-water plants. These are basically huge fishnets, set up in the water. You can see these stations everywhere here in the fjords. “It is a hard business, hard work” he says. So after many years in this business he became captain of the ferry and brings cars, busses, motorbikes and some few tourist bicyclists to the Carretera Austral. He does this trip every day, 4 hours south, 4 hours north. 7 days a week, all around the year. He gets long vacation though, and so when he is at home with his little kids and his wife he has real quality time. He knows the fjords around here by heart. “172,5” he says, giving a slight course correction to the pilot. Ricardo uses the two levers to bring the ship to the new course. He is piloting the ferry now. He used to be a fisherman. On different boats he hired all over the world. He travelled along the South African coast, all along North and South America, crossed the Atlantic a couple of times. He describes the rough sea in the southern pacific and how the waves hit the boat from below when he passed Cap Hoorn. “Very big waves, like hammer” he says, moving his fist from below against his left hand, demonstrating how the waves hit the boat from underneath. When he talked about the big waves in the antartican sea I asked him if he was ever scared. “No. The sea, it’s my life”. Looking at his face with the leather like skin I believe him. So why did he end up here, on a small ferry going back and forth the same route every day. That must be boring. But the fishing business is hard. Very hard. He obviously enjoys the more quite days he has in his new job. Given the beauty of the surrounding area it is easy to understand how this is a great job for a seaman. It is a great 3 hour ride. Claudio, the captain, a very nice, calm and interesting person. Ricardo, the pilot on the rudder, which is not a classic wheel, but two sticks that control two rudders. We got a detailed tour of all the equipment of the vessel. Through this little gap the “Dresden” was maneuvered to escape the British fleet. One of the many salmon breeding stations. I know Padre Eduardo from the last time I was here in Peru. And my Mum knows him from her many visits here in Palca. He is a good friend. He knew my Dad. They both liked and respected each other a lot. Padre Eduardo and his colleague Padre Luis are taking care of the needs of the people here in Palca. And they do this since many years, as they are both far over 30 years in Peru. And they do it with a dedication that blows your mind. 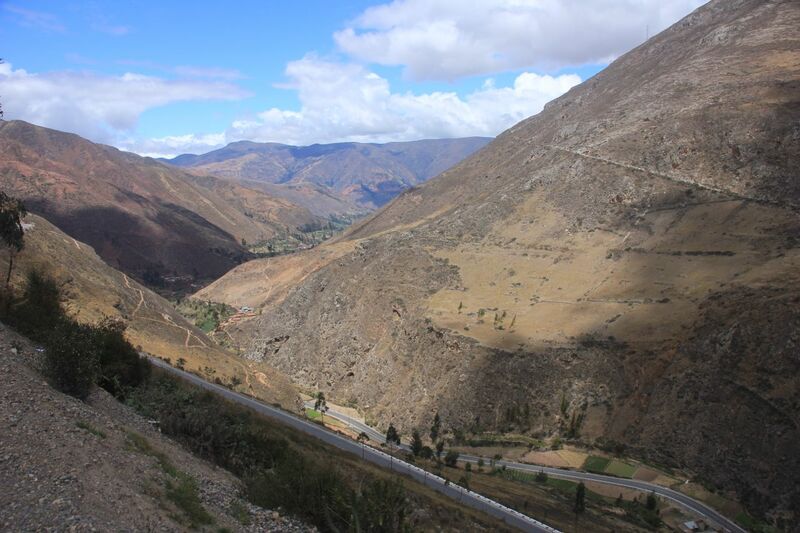 The conditions to live in this part of the Andes are harsh. 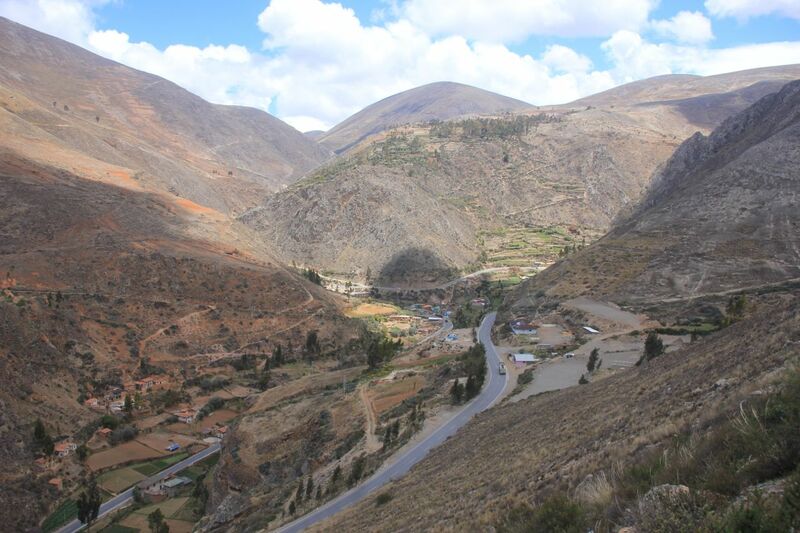 But they visit all the little villages up there in the high Andes. It is difficult to get up there. But people ask them to get a mass and so they go. They go as far as the 4×4 gets them. And then they walk. To the little “Nest” up there as the Padre puts it in German. They sleep in the houses of the poorest of the poorest, because they ask for spiritual succor. Because they ask for help. Because the spiritual succor the two can offer have a lot higher meaning here in Peru than we can imagine. We have this so very different image of the church in mind that is present in Europe. Here this all means a lot more. This is what religion and church is really about. This is where people like the two padres really make a difference. And they are dedicated. Padre Luis tells us his story of when he arrived in this area after he had spent 14 years in one of the most polluted cities worldwide, Cerro de Pasco. He has been working as a priest in different countries already and knew his ways around when things get difficult. So when he was asked in his first month in Palca to hold a mass in one of the little villages up the mountain he didn’t hesitate. Even though it was a long way up, even though it was a difficult rugged road up the hill, even though it was rain season. He jumped into his 4×4 and slowly drove the road up the hill. It became difficult, but he knew how to use the power of the 4-wheel-drive car and made it. After he held the mass, he picked up two young priests in another village and wanted to get down again. In the meantime it got dark, the rain had started and the road turned from a rugged road to a bad slimy and slippery mud pipe. The road went along a steep mountain with a 200m cliff on his right side. Going around a corner there was a landslide. They got out and worked with the shovels on the slide to make it possible to pass. After half an hour he decided to give it a try and got back into the car. He sort of slid through the passage as the tires spun in the mud. Suddenly the back of the car drifted to the right until one of the tires hung over the cliff. They all got out. Continuing was too dangerous, so they called for help. Eventually some people from the next town arrived with a couple of tools and ropes to securely get the priests car off the cliff and back on track. The priest went to this village the following week and many times during the rain season again. The slopes are steep and many little towns are very hard to get to, especially during rain season. 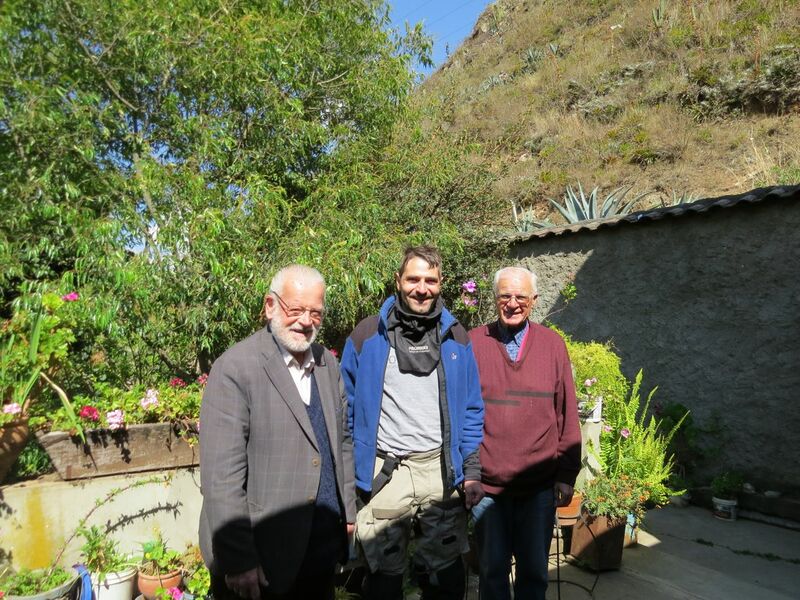 His colleague Padre Eduardo is from South-Tirol. A quite elderly, and wise man with a great sense of humor. He has a million stories to tell about his time here as well. During the main time of the activity of the shining path he was held hostage for a day. When the commander of the group pointed a pistol at his head and asked him to kneel down, he told him he wouldn’t kneel in front of anybody. The terrorist was impressed. They let him go. Both persons are great and of an impressive coolness when they talk about the difficulties and dangers they had here, especially in the days of the shining path. People around them have been killed and slaughtered. And they were asked whether they would like to stay. All other authorities had left the area. But they stayed. A great wordplay since pastores alemanes has a double meaning: it can mean “german priests” or “German shepard dogs”. We were deeply impressed by these two old fellows. The braveness, their trust in God, their dedication, their will to help other people, their modesty. It makes you ask yourself about your own attitude about the world that we live in.